As I mentioned in my previous post, Chris and I decided to cook dinner last weekend. Wondering the aisles of Whole Foods, we searched for some inspiration. We finally found it behind the fresh fish counter where the man working there was yelling, “King salmon, the best salmon, on sale! Buy some; it never is!” And so off we went with our fresh king salmon (and bottle of Delirium Tremens). Now, how to prepare it? I had also recently bought some delicious marinaded artichoke hearts, so I knew I needed to incorporate them somehow. Once again, we searched for inspiration – this time, on the Internet. We finally found a recipe by Joy Bauer that was healthy and had both pesto (the Chris loves) and artichoke hearts (that I love). We based our recipe off this combination of ingredients. Preheat the oven to 350°F and build a boat for each filet out of aluminum foil. 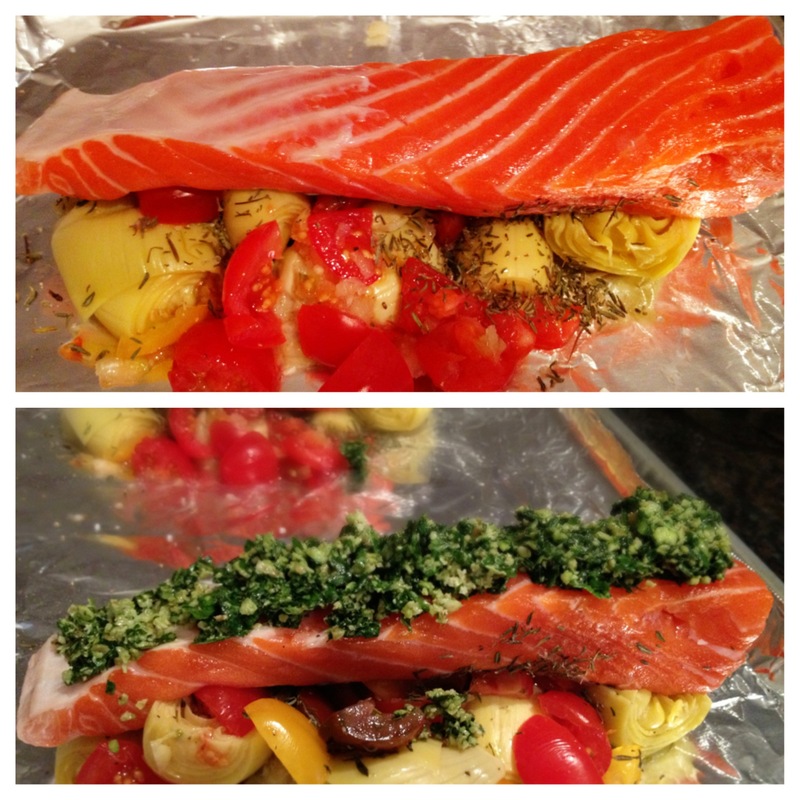 Make sure that you can close the foil around each filet, so that you can really trap in the flavor. 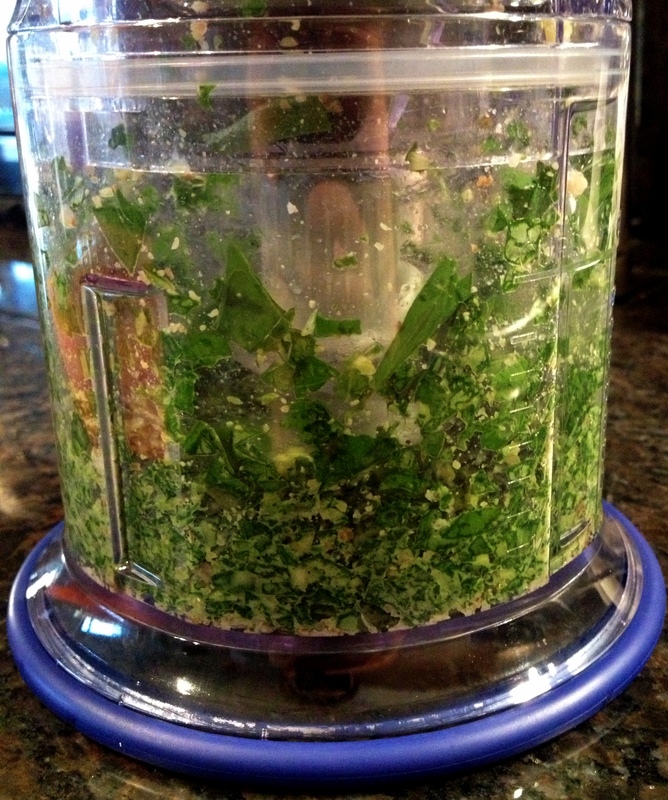 Blend the roasted pine nuts, basil, lemon juice, kosher salt, and 1/4 tbsp olive oil in a food processor for around 30 seconds until you have pesto! In a small bowl, mix together your marinated artichoke hearts, diced tomato, minced garlic, and pepper to taste. Place this mixture in each of the aluminum foil boats, making a foundation for each filet to sit on. 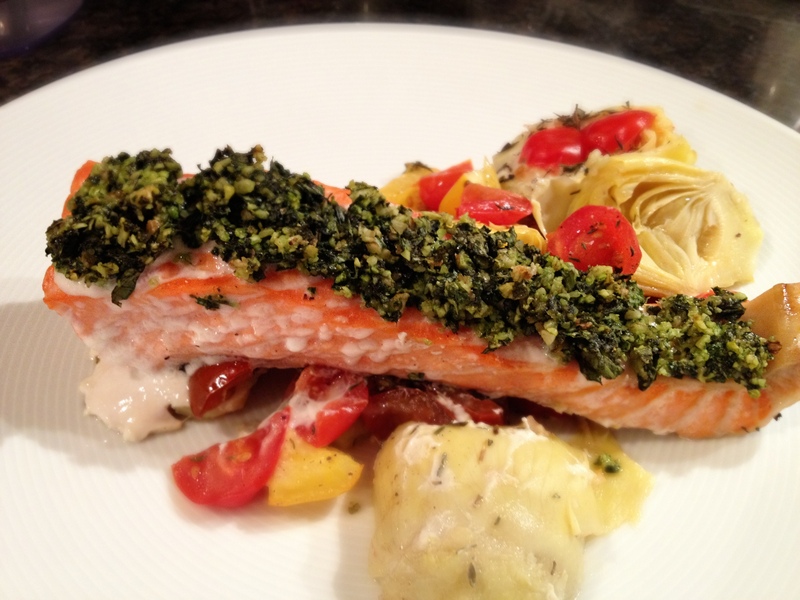 Coat each filet with 1/2 tbsp of olive oil and pepper to taste before placing it on it’s bed of artichoke and tomato. Then spread the pesto over each of the filets. Place the boats (I know, I forgot to make boats!) on a baking pan and bake the, for around 20 minutes. Once they are cooked through and flakey on the outside, serve and eat the, right away.